The sound of raindrops pattering is universally soothing, and it’s no coincidence that so many relaxation music tracks involve the sound of running water or that spas are overflowing with fountains. And what’s more relaxing than standing under a waterfall? You can bring those feelings into your bathroom so that you can enjoy it whenever you want (and with no need to rely on weather forecasts!). 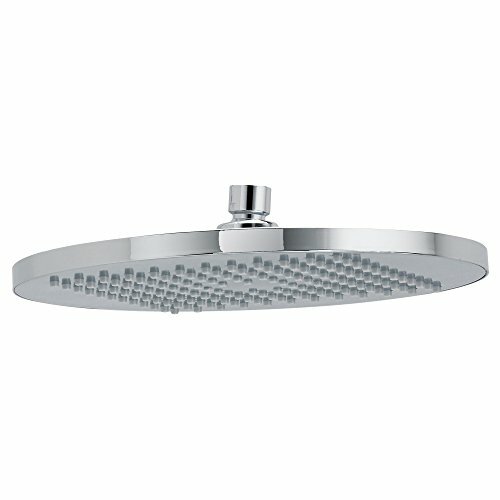 A rain shower head will turn your mundane daily shower into a de-stressing experience akin to frolicking in the jungle. In a hurry? Here’s a comparison of the top 3 products. Then, we’ve created a super-quick guide to buying rain shower heads, followed by more detailed reviews of our top 8 picks. 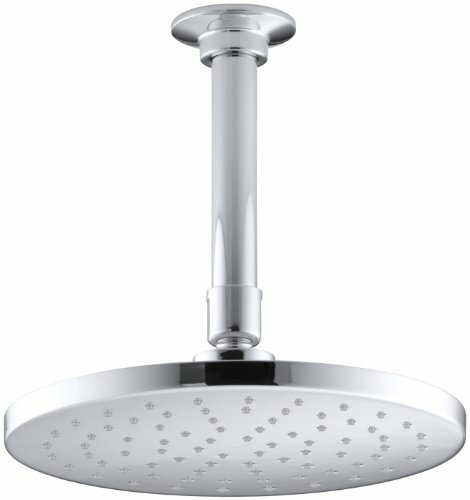 What Is A Rain Shower Head? 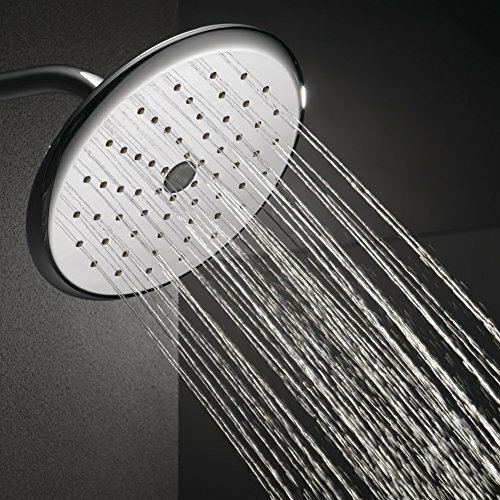 A rain shower head is designed to make its water output resemble anything from a light drizzle to a romantic waterfall. It looks like a disk with multiple rubber holes through which the water streams out. With the best models, you can adjust the settings and the water flow to a gentle afternoon drizzle or to the powerful downpour of a rainstorm. Apart from giving you the feel-good factor, these products also provides some utility. Their wide heads ensure good coverage at various heights without needing adjustment. Some types come with dual heads so that they can cover your back and front at the same time, both for efficiency and enjoyment. There are also models with a waterfall feature – while they’re pretty great as an occasional treat, they also waste a lot of water so we can’t really recommend them for your home spa. New shower heads are usually easy to install—just unscrew your boring old piece of junk and attach a gleaming, majestic new one in its place. Fun: These products turn simple showers into hedonistic treats. They relax you and bring a little of the outdoors into your home. Enjoy the power of nature without having to worry about pesky lightning strikes, bugs, or paparazzi! Efficiency: Since they are quite a lot wider than ordinary shower heads, they have a wider area of water coverage. Spend less time turning and attempting to squeeze yourself under that thin spray, and more time rinsing and relaxing! Variety: Some models have several shower spray settings for you to choose from, whether you want a soothing rainfall or a brisk, powerful spray. Customize your shower to your heart’s content! Decor: They look stylish and lend that luxurious edge to your bathroom. 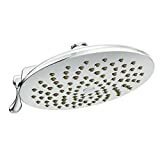 If for some reason you have tons of bathroom visitors, rest assured that they will be struck with desperate envy at the sight of your glorious rain shower head. The best option for you will vary depending on your tastes, your bathroom design, and your budget. Size: You’ll want to make sure it fits in your shower stall, because that would just be awkward otherwise. And of course, you’ll want it to be wide enough to provide you with ample water coverage. Spray Quality: Quite a few of the popular models have unique technology that lets them deliver varying kinds of shower sprays, from air-mixed water to realistic rain drops. You’ll know which one appeals most. Durability: Trusted household brands are always a good sign, but there are also lesser known brands that are surprisingly terrific value for money. Style: They usually come in different colors (except for the ones that come in chrome and only in chrome). You’ll be able to pick from interestingly named colors like Venetian Bronze and Starlight Chrome to make sure your new rain shower head matches your bathroom decorating style. Let’s take a look at the top contenders and see what best suits you. Here’s our Top 8 picks for the best rain/waterfall shower heads based on the criteria listed above and our own personal preferences. This Grohe model is surprisingly small, so it could be the best bet for you if space is tight. With a diameter of only 6.25 inches, the Grohe will fit into tiny shower enclosures and still give you that fresh rain shower experience. 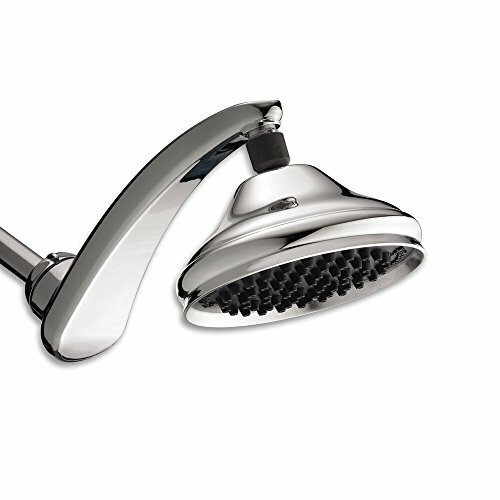 The Grohe rain shower head uses a trademarked StarLight™ finish to make the surface resistant to scratches and tarnishing. This keeps your product looking new for much, much longer. Note that while it looks like metal, it’s actually plastic. For color, you get to choose from 4: Bronze, Brushed Nickel, Oil Rubbed Bronze, and the romantically named Starlight Chrome. We liked its ‘DreamSpray advanced shower engine technology’, which optimizes water distribution to be both consistent and accurate. This gives you a rain shower spray with even water coverage and precise angling. You get to choose from 4 spray patterns whenever you take a shower: rain, jet, champagne, and laminar. This rain shower head has a SpeedClean® anti-lime system built in. You only need to wipe your finger across it to get rid of any limescale and maintain its shower efficiency. This model is ceiling-mounted and delivers 2.5 gallons of water per minute. You get a limited lifetime warranty for the product itself and a lifetime finish warranty. Here’s another contender with an awesome name. The Hansgrohe Raindance Downpour just conjures up images of fierce tribal shaman dancing for rain, and the resulting torrential downpour. This has a decent diameter at 9.375 inches—generous enough for you to enjoy said downpour. It’s made of brass and fully chrome-plated (something to take into consideration when matching shower heads with your bathroom décor), and has flexible silicon nozzles. Its flow rate is 2.5 gallons per minute. The installation method is wall-mounted. For color, you get a choice between Chrome and Brushed Nickel. Notably, it touts a RainAir spray mode, which is created by ‘AirPower’ technology. This mixes in air with the water, making the drops feel fuller and more pleasantly intense when they fall on your skin. It basically makes it feel like the 2.5 gallons per minute you’re getting is 3 times that amount, but in a good way (not in an omg-I’m-drowning way). You can check out the difference by briefly covering the air input hole during your shower. It’s got QuickClean anti-calcification built in, which means that you can easily rub off limescale deposits from the soft nozzles to prevent clogging. Easy cleaning and low maintenance! This model is wall-mounted, and has a water flow of 2.5 gallons per minute. First on our list is the Alfi, whose most notable feature is that it’s made entirely of solid stainless steel. (In fact, the company notes this in exclamation points!) The stainless steel is brushed and doesn’t easily retain fingerprints on it. 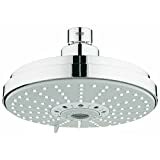 This slim silver disc is a pretty modern style compared to the rain shower heads that are made of brass, so consider this in line with your bathroom style. As such, it comes in just one color: Brushed Stainless Steel. Most noteworthy is its enormous size. It’s sized 16 inches in diameter (think pizza! You’re showering…under a pizza!) and is quite flat, with a thickness of only 2mm. If you always had dreams of showering in enormous sheets of rain, this one’s for you. This one has a swivel adapter that lets you turn the shower head to any angle you like during your shower. Its rubber nozzles are easy to clean if they get clogged up, and it also comes with 5 replacement nozzles if for some reason cleaning doesn’t work for you. The entire shower head body is made of solid stainless steel! Next up is the Kohler. Its sleek design lends it a finished minimalist look that fits in with any contemporary bathroom. It’s sized 8 x 8 x 2.8 inches. You can choose from the 4 colors Polished Chrome, Vibrant Brushed Bronze, Vibrant Brushed Nickel, Vibrant Moderne Brushed Gold, and Vibrant Polished Nickel (because their colors aren’t just any old brushed colors—they’re vibrant). Kohler touts a Katalyst Spray Technology™ of their own design that makes using their shower heads a luxurious experience. They also have a MasterClean™ sprayface design with transparent nozzles that avoid mineral buildup and clogging, lengthening the product’s lifespan. Less clogging and less cleaning means lower maintenance and better durability, which is always a plus. Additionally, the sprayface design has been optimized for a richer spray pattern, better coverage, and overall comfort. This model is wall-mounted. Its water flow is the industry standard 2.5 gallons per minute. It comes with a lifetime limited warranty. 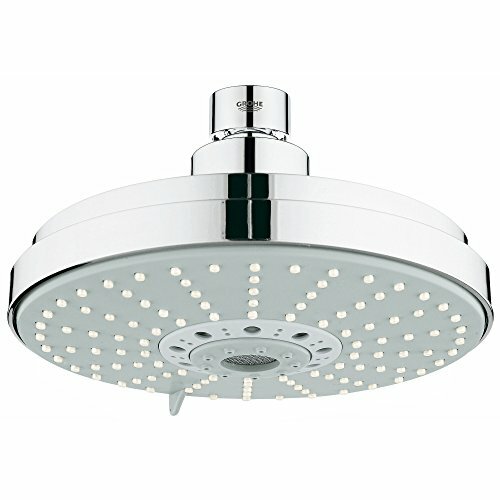 Another contender for the best rain shower head is the Waterpik RPB-173. It utilizes an advanced OptiFLOW technology to deliver a water spray that’s more powerful and covers a wider area. The stronger water pressure gives you an invigorating experience while you get clean! It’s sized 7.8 x 6.4 x 12 inches, and is made of ABS. It comes in just one color: Chrome. It should go nicely with most bathroom furnishings. This shower head is also quite affordably priced compared to its competitors on the market—it’s actually BY FAR the lowest-priced on our list. It comes with a lifetime warranty. Because, of course, the only thing better than a lifetime limited warranty is a lifetime warranty! It measures 2 x 8.8 x 2 inches. For color, you get to choose from Chrome, Polished Brass, Stainless, and the intriguingly named Venetian Bronze. It also has a Touch-Clean spray face, which lets you just clean the head with your fingertips to remove minerals that may clog it up. It has a 2.5 gallon per minute flow rate. It comes with a lifetime limited warranty that covers the finish and part defects. Tens of thousands of satisfied customers would nominate the American Standard as top of the class. This is a minimalist model, plainly made, with no frills and no extra settings. It just works, and works well. With a generous diameter of 10 inches, it’s made of brass and you can choose between polished chrome and satin nickel. It has a spray face that’s easy to clean, and it’s also easy to install. Note that this model is ceiling-mounted. It has a 2.5 gallon per minute water flow. And the feeling? It produces a mild and relaxing flow of water, and when we tried it out, it was so enjoyable that we wanted to linger. 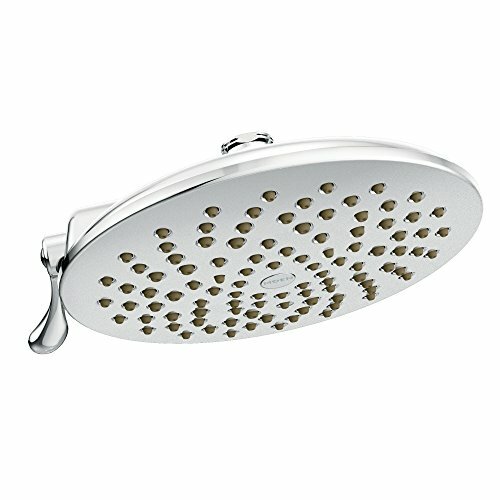 And finally we reach the number 1 rain shower head – based on its features, price, and legions of delighted customers—the Moen S6320 Velocity. It measures 8 inches across and is made of brass. It comes in 4 colors for you to choose from: Antique Bronze, Brushed Nickel, Chrome, Oil Rubbed Bronze. This little gem is a great favorite due to the quality of its materials, as well as the quality of its spray. It offers two settings to choose from: a Rain Shower setting for that lovely drizzle you expect from one of these products, and a Concentrated Rinse setting for when you’re 10 minutes late for that meeting and the dog’s eaten your shoe. Most noteworthy is that Moen has implemented an advanced technology wherein the water flow is coursed through with 3 times as much spray intensity, thanks to a built in self-pressurizing system. As a result, you get a rainfall experience that feels quite realistic. This model is wall-mounted and delivers 2.5 gallons of water per minute, and it comes with a limited lifetime warranty.